The milestone, reported by two teams of scientists working separately, isn't a cure. The patients walk only with assistance — holding onto a rolling walker or with other help to keep their balance. Switch off the spinal stimulator and they no longer can voluntarily move their legs. "The walking side of it isn't something where I just leave my wheelchair behind and away I go," Chinnock, of Tomah, Wisconsin, told The Associated Press. But, "there is the hopeful side of, maybe I'll gain that — where I can leave the wheelchair behind, even if it is to walk to the refrigerator." The work is part of a quest to help people with spinal cord injuries regain function, and specialists say while it's only been attempted in a few people, it's a promising approach that needs more study. "I'm really excited about this," said Johns Hopkins University rehabilitation expert Dr. Cristina Sadowsky, who wasn't involved in the new research. It tapped into "residual connections that are not being used" after a spinal cord injury. Still, "not everybody who has a similar injury will respond the same," cautioned Sadowsky, who directs spinal cord therapy at Baltimore's Kennedy Krieger Institute. Severe spinal cord injuries leave the brain's "get moving" instructions unable to reach the nerves that activate muscles. Researchers have tried other technologies, such as encasing patients in robotic-like exoskeletons or implanting muscle stimulators, to help move paralyzed limbs. How does it work? One theory: Circuits of nerves below the injury site are dormant, but still living. Applying electrical current, in customized patterns, could wake up some of those circuits and, with rigorous rehab to revive the rusty connections, eventually enable them to receive simple commands. "Recovery can happen if you have the right circumstances," said University of Louisville professor Susan Harkema, who co-authored the New England Journal study. The spinal cord "relearns to do things, not as well as it did before, but it can function." "This study gives hope to people who are faced with paralysis that functional control may be possible," said Dr. Kendall Lee, a Mayo neurosurgeon who treated Chinnock and co-authored the Nature Medicine report. Four years ago, Harkema's team made headlines when a few patients implanted with spinal stimulators — originally developed to treat pain — were able to wiggle their toes, move their legs and briefly stand. But they didn't walk. Lee and Kristin Zhao, who directs Mayo's assistive and restorative laboratory, decided to repeat the experiment — and Chinnock's success surprised them. He'd been paralyzed in a 2013 snowmobile accident, with no movement or sensation below his mid-back. He underwent 43 weeks of intense physical therapy and stimulator adjustments. At first, trainers positioned his knees and hips to help him stand, swing his legs and shift his weight on a treadmill. He can tell his therapists when he's going to start, stop or speed up, Zhao said: "It's very much a thoughtful, intentional movement." 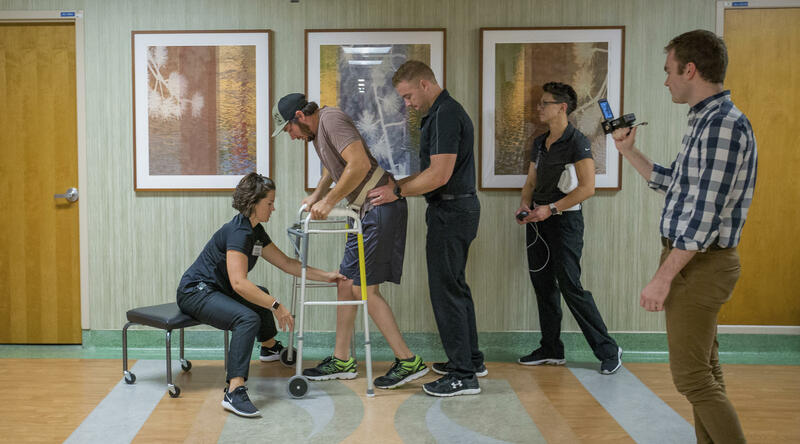 Meanwhile in Louisville, Harkema's team was working with four more paralyzed volunteers eager to test the approach — and this time, two eventually walked with assistance. In one training session in the lab, Jeff Marquis, 35, of Louisville made it almost the length of a football field without stopping for a rest. "One day we were walking and they were helping me as usual and then they stopped helping me and I took maybe three or four steps in sequence," Kelly Thomas, 23, of Lecanto, Florida, recalled in a video provided by Louisville researchers. "My eyes got teary and I was like, 'Oh my god, that just happened, I just took steps.'" It's not clear why the other two Louisville, Kentucky participants weren't able to take independent steps. But that report illustrates an important caution about safety: One fractured a hip during a rehab treadmill exercise even while carefully supported and upright. The approach will need larger and longer studies not just to see if it can help other patients but to delineate risks. It's also not known how much such care would cost, as researchers work to improve the stimulators.